An imaging system from Preston-based Image Solutions (UK) Ltd. or (IMSOL) is central to research being carried out by scientists at Cardiff University into how stem cells can be used to treat spinal injuries. Headed by Professor Bing Song, the University’s Institute of Tissue Engineering and Repair is two years into a five-year, €1.76m European Research Council project to investigate how controlling the migration of neural stem cells influences the repair of spinal cord injuries. The team is focusing on how minute electric fields can be used to guide these stem cells to specific sites of injury as part of an overall repair therapy.“We are trying to optimise the conditions needed in order to establish the best scenario for guiding the stem cells to their required locations. The wide field deconvolution system is one of the most powerful imaging systems available and is saving us a huge amount of time because it is possible to observe so many different events in one experiment,” explains Professor Song. 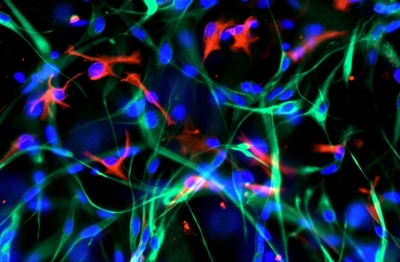 Green fluorescent proteins are introduced into the stem cells beforehand. Once they arrive at the scene of the injury and the stem cells begin to divide and differentiate, these proteins can be switched on and off and therefore detected as bright green fluorescence, depending on which gene they represent. This way the scientists can see exactly where the stem cells are relative to the damaged nerves. Professor Song’s imaging system is a high throughput microtiter plate based wide field deconvolution restoration microscope. It is built on an Olympus IX71 inverted microscope with a 250 watt xenon lamp and a LED transillumination light source. The plate stage can hold multiple format plates (96-, 384- and 1536 well microtiter plates) as well as traditional slides. Three high-resolution objectives are supplied with the system to address a wide range of optical imaging. The system utilises a 10 position excitation filter wheel and a 6 position emission wheel for wide range of fluorescent dyes. So impressed is he with the results generated by the imaging system from Image Solutions that Professor Song hopes to invest both in more sophisticated imaging technology in order to see individual cell-to-cell interactions, and single-cell manipulations in a 3D environment.